Plaice are usually plentiful on marks such as The Blocks and around Swashway from late March onwards. One of my favourite methods is to fish a wishbone rig, with a string of beads on each hook length. I have sometimes caught two plaice at once on this rig, and it is not unusual for the plaice to take both baits. I used to use small hooks but I now use size 1 fine wire, baited with a juicy ragworm and tipped with a strip of squid. Alternatively, use a single flowing ledger rig with plenty of beads – don’t be afraid to put 20 or more beads on. The trick is choosing the colours. Try alternating black with another bright colour, the theory is the black beads look like pea mussels, the coloured beads just make them come over and have a look. Fishing tackle is like fashion, every year there is a new must-have. This year it is the beaded spreader rig sometimes known as the Island rig, available ready made from Solent Tackle or you can easily make your own. They just need an eight inch trace on each end with size one or two Aberdeen hooks. Don’t skimp on the weight, you need something to thump the bottom and hold down with all that bling even in a tide. It might look cumbersome but it does work, I have caught fish on this rig when three other rods with conventional plaice rigs blanked. Bass will be totally spooked by the usual garish plaice rig, yet they will be frequenting similar territory. Try fishing a second rod with a 10 foot flowing trace of 12lb line or lighter, with no adornment. You may be surprised how many bass you pick up on the bead-less rig. They may be on the small side, but there will be some better fish among them. My friend in Southsea told me of a hectic session when smoothound were grabbing bunches of live prawns almost as they hit the seabed. Prawns are numerous around the weedy undersides of pontoon floats, and ten minutes work with a fine mesh net will give you a bucketful. Hook half a dozen through a tail segment and you will have a lively bait for pollack, wrasse, smoothound, bass – or anything predatory. Large raw prawns from the supermarket are great smoothhound baits but they do seem to attract a rather odd catch – starfish! This a vastly under-used and under-rated method of bringing on more fish. It can be used from boat or shore, and is a form of ground-baiting. What you do is drop a steady stream of chunks of bait into the water. You might think the tide will swish it far away from your hook, but fish will swim up the trail and find you. I have successfully chunked in up to 60 feet of water, and fast tides too. If you are using squid, cut up chunks about a quarter the size of your hook bait, and you can also make use of the washed out hook-baits as you change them. If using mackerel, chop chunks up, the bloodier the better, and feed them in – four or five chunks every five minutes. If you want proof it works, open the stomachs of fish you catch to keep after chunking for a while – you will almost certainly find them stuffed with your chunks. I (and friends) have caught bass, whiting and bream after drawing them in with chunks. We have probably drawn tope and ray as well, but we didn’t open those to see! Proof enough, anyway. In Summer, the sea around the Solent area will be teeming with mackerel, yet some days they are a lot more difficult to catch than others. I suspect they are always there, but not always willing to throw themselves on any old set of feathers. If mackerel are hard to catch, try different types of feather. One day flashy flectolite feathers will catch, other days these will be ignored but small hokkai and shrimp rigs will work. I am also convinced that line thickness is a factor. When shoaling and in a feeding frenzy, they will grab anything. When not so hungry, and perhaps cruising in smaller groups where the competition is not so great, they can afford to be more selective. Those huge eyes mean they hunt by sight. If they can see small fish they can certainly see a rig tied to 60lb line. If you are not catching with normal mackerel rigs, try scaling down to the small “bait” rigs which are mini feathers tied to much lighter line. If you hook a number of very active mackerel at the same time there is a good chance these light rigs will be ripped apart. The best compromise, if you have the patience, is to tie your own. You can very easily make up feathers on size 6 hooks and tie up a trace using 15lb or 20lb line. You will have a much better chance of catching when they are in a finicky mood, and less chance of being broken up. To tie feathers all you need is some cotton thread, and whatever you can scavenge from the Christmas present-wrapping box. Curling ribbon cut in short lengths at an angle will work for the body, as will the shiny thread with a string core – just pull the core out and tease out the shiny threads. You can add tails with small bunches of glittery thread or fibres from decorations, you don’t need much. Just whip your chosen glittery stuff on with the thread, and seal with Super Glue. It is much easier if you hold the hook in a small vice while you do this. The photo above is about twice actual size. I added some beads from a old set of lures, I’m not sure that is necessary but as I had them, I used them. They slide up and down the line as the lures are jigged, and make a faint “click”, which is an added attractor. To add even more attraction, paint the weight white or use a pirk or heavy, flashy lure as the end weight – hooks aren’t necessary. This makes the mackerel think their mates are chasing bait fish and come over to investigate. This is an American term, and it refers to adding some form of scent to an artificial lure to add to the attraction and help fish home in on the lure. You can either add a tough strip of mackerel skin cut from the belly flap, a piece of squid, or a piece of salted pork rind to one of the hooks. Make sure the bait is not so large it interferes with the action of the lure, and check it is still there every few casts. This method works particularly well with feathers and hokkai lures but can be used with any type of lure from spoons to plugs. I am told that blood contains salt traces, and salt is an attractant to predatory species. Maybe they pick up the salt trail and think it has something to do with blood from a wounded prey. Many plastic soft-baits are now being manufactured impregnated with salt, but salt can be used on its own. Take a small plastic canister like a35mm film canister and drill a small hole in the centre of the base and lid. Drill another small hole on the lid and bottom. Run the trace through these holes and stop the canister just below the lead on a running ledger rig. Fill the canister with salt – dishwasher salt is pure salt and the cheapest way of buying it – and fish as usual. You will find the salt lasts 20 minutes or so, more or less according to the size of holes and the flow of water. I am not promising this is a miracle fish attractor, but I have experimented with multiple rods, some using a salt canister and some not, and the salt definitely attracted more bites. Sole are rarely an accidental catch from a boat, but good bags can be taken if they are targeted deliberately. Sole are exclusively nocturnal bottom feeders, so your approach and method must take that into account. Calm summer nights inshore over mud and sandy bottoms are best, often in as little as ten feet of water. When the boat is that close to fish, you need to keep disturbance to a minimum – no crashing and banging around the boat, and no bright lights. Sole feed by burrowing into the sand and mud, so baits have to be hard on the bottom. Here’s a trick to keep them where the sole feed. Rig a trace with three hook droppers as you might for beach fishing. Put a 4oz weight on the end, and here’s the weird bit – put a two ounce weight at the top of the trace. This is to keep all three baits right on the bottom. To make sure, you can clip a coarse anglers swan shot in the hook length just above the hook. Baits are usually worm, and as a sole’s mouth is small, use small Aberdeens size 2 to 6. The best rods to use are carp rods or even lighter. Cast away from the boat, and watch carefully for the bites. As with most flatfish, give them time to take the bait. Best areas to explore for sole are the Solent shores, and you may find them off Haslar wall and Southsea/Eastney. I am sure you use squid strips for bream, it is the standard bait we all rely on. When mackeral are in, you can also try strips from the silver belly flaps. A killer bait around the rocky marks off Hampshire however is squid head. Pull off the head, slit in two between the eyes and you have two baits with about five tentacles each, dripping with tasty goo. The head is good and tough so be careful not to bury the point of a small hook. I find that if you miss a bite, there will still be some bait on the hook (unlike a single strip) so if you drop straight back the fish will invariably have another go. And while on the subject of bream, don’t be afraid to go very small with hooks. 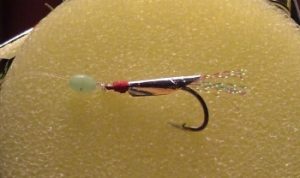 I use trout fly hooks size 6 to 10, which are barbed and strong. Most hooks in the shops of this size are coarse angler’s barbless hooks, which might be good for conservation but won’t hold a bream on for long. Carp hooks with a micro-barb are also worth using.